Planning on getting inked soon? If you don't have a shape or word in mind yet, these tattoo ideas will ~complement~ your personality. An Aries is independent and always aspires to achieve the life they've always dreamed of. A shooting star is appropriate because it shows a rising direction and it doesn't stop moving until it reaches its goal. The palm tree represents stability, making it ideal for a sign who is grounded in life and love. Your star sign is represented by the twins, which means, like yin and yang, you have two different sides to show the world. Being an emotional sign with a strong nostalgic side, getting a numeral tattoo is a great way to remember a significant day or an occasion forever. Leos are natural-born leaders. Why wouldn't you want a crown for a tattoo? It's as bold as your personality! You're always there to lend a helping hand and everything you do is out of love. Naturally, a delicate heart tattoo will match your kind personality. An intense and deep sign, it's no surprise that a meaningful quote or word is what a Scorpio would go for. They are known for being outgoing, optimistic, and happy-go-lucky. 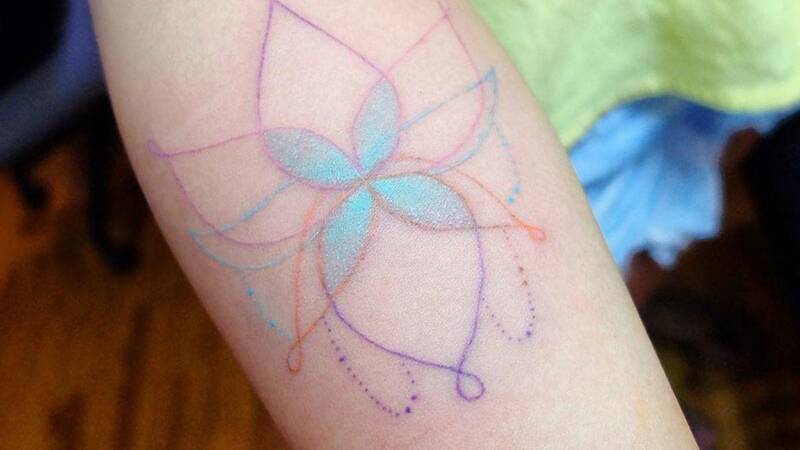 Fun and colorful watercolor tattoos are the perfect body ink for this extroverted sign. A traditional and independent sign, a geometric shaped-tattoo represents the many layers of your personality. An Aquarius can either be shy or energetic, so a white tattoo will suit them! It's soft, yet bold and unique. Just like a butterfly, the Pisces is gentle and easygoing, yet has a vibrant and strong personality that draws attention.